Basics of Acupuncture shows that it is possible to integrate Western medicine and traditional Chinese concepts. It starts with an updated review of the scientific bases of acupuncture and related research. A short introduction on the theory of traditional Chinese medicine is followed by a detailed account of diagnosis. 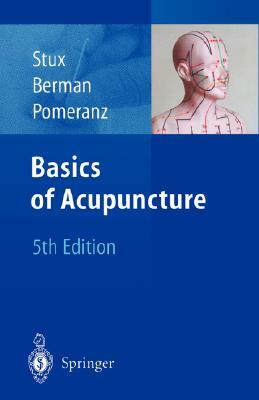 Main topic is the description of the Chinese systems of channels, functional organs and the most important acupuncture points. The remainder of the book is devoted to treatment, based on western modes of diagnosis. The methods and applications of needling and moxibustion are described, and the most important points are given for frequently encountered diseases. Dr. Gabriel Stux, MDAcupuncture since 1977 in China, Sri Lanka, IndiaFounder and Chairman of the German Acupuncture Society, Dusseldorf, 1978, Lectures on Acupuncture all over the world for more than 20 yearsIntroduction of a new energy medicine, called Chakren Acupuncture in 1988 Dr. Brian Berman, MD, ProfessorFounder and Director of the University of Maryland Complementary Medicine Program (CMP), 1991Professor of Familiy Medicine, trained in acupuncture, homeopathiy and other CAM-approachesPrincipal Investigator of a NIH center grant for compementary medicine researchInternational Seirin award for his contributions to the scientific understanding of acupunctureChair of the steering committee of the Consortium of Academical Medical Centers whose mission is to promote integrative medicineCo-Chair of the editorial board of the report to the NIH: Alternative Medicine: Expanding Medical HorizonsCoordinator of the Complementary Medicine Field of the international Cochrane Collaboration Dr. Bruce Pomeranz, MD, PhDMD and CM at McGill University 1961, PhD at Harvard 1967University of Toronto, Professor of Zoology and PhysiologyAssistant Professor at M.I.T 1966-1968 "